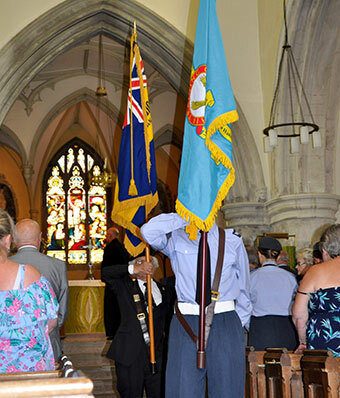 Cadets from 1824 (Saffron Walden) Squadron of the Royal Air Force Air Cadets returned home from annual camp at RAF Odiham just in time to receive a new squadron banner following a special service at Debden Parish Church on July 22nd. Following a packed time in Hampshire which included flying in Chinook helicopters and Tutor aircraft, the Saffron Walden cadets donned their ceremonial finery for the official Dedication. The service was taken by the Squadron Chaplain, Canon Chris Bishop and attended by the Mayor, Cllr Paul Fairhurst, the Commanding Officer of 33 Engineer Regiment and other Officers from Carver Barracks. Also in attendance were representatives of local Royal British Legion branches Saffron Walden, Debden and Thaxted, along with their County Chairman, Col (Retd) Roger Burgess. Saffron Walden Air Cadets are based at Herberts Farm Playing Fields and parade on a Monday and Thursday evening. Any young people interested in joining can contact the squadron by emailing adj.1824@aircadets.org.